The Douglas Dolphin was an amphibious flying boat. While only fifty-eight were built, they served a wide variety of roles: private "yacht", airliner, military transport, and search and rescue. The Dolphin originated in 1930 as the "Sinbad", a pure flying boat without wheels. The Sinbad was intended as a luxurious flying yacht. The Great Depression had curtailed demand for such extravagance, so the Sinbad was sold to the United States Coast Guard. Undaunted by the lack of demand, Douglas developed an improved Sinbad in 1931 that was amphibious, so it could land on water or land. This improved aircraft was named "Dolphin". 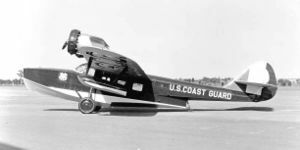 The first two were purchased by Wilmington-Catalina Airlines to fly passengers between Los Angeles and Santa Catalina Island, becoming the first Douglas airliners. Subsequent examples were ordered by the US Navy and US Coast Guard for use as transports and search and rescue craft. The US Army Air Corps ordered several under the designations C-21, C-26, and C-29. Many were eventually ordered for their original purpose as luxury transports. Owners included William Boeing, the founder of the Boeing Company, and Phillip K. Wrigley, the son of the founder of the Wm. Wrigley Jr. Company. One was even procured by the US Navy as a transport for President Franklin D. Roosevelt. Although never used by Roosevelt, this was the first aircraft procured to provide transportation for the President of the United States. Australia (RAAF), United States (US Army Air Corps, US Army Air Force, United States Coast Guard, US Marine Corps, US Navy). This page was last edited on 6 March 2007, at 03:45.